Standard - $64.99 Only 4 left! Boy, somebody get this guy some Lubriderm! Dry winter skin is the worst, amirite? One minute you're walking around, glorying in the feel of your tanned, soft, naturally-moisturized skin, and the next thing you know you've got the hard cracked, scaly skin of a crocodile! Man is that irritating! It's enough to turn any mild-mannered sideshow wrestler into the kind of guy who's showing cannabalistic tendencies and going off on superheroes! But don't let it get you down! After all, a super stylish trench coat and a dapper fedora can do a lot of disguise the kind of skin that would make an ordinary citizen of Gotham City shriek in terror. Sure, your aunt was kind of a jerk about it and didn't exactly go a long way to make you feel confident and secure about your looks, but she's out of the way now (because she moved to Paris to live forever, right? Riiiiiiight? ), so it's time to turn those lemons into lemonade! How about pursuing a personally fulfilling, financially lucrative career as a hitman? It's a fantastic way to release some of that anger you've got built up underneath those scales, and when you really think about it, you're providing a much-needed service to your clients. After all, if you can't be appreciated for your looks, you mighta as well be valued for your skills, yeah? And sure, it's got it's drawbacks...like, sometimes you're not always the most popular guy in the alleyway, and every once in a while you have a bad day and end up locked up in a maximum security prison. But you also can't put a price on the valuable professional and social contacts you've made in your line of work, and at the end of the day, Taylor Swift's got nothin' on your squad. So when the going get rough (get it? Cause your skin is rough! Like a Crocodile's! Sorry, I'll see myself out...), slip on this Suicide Squad Killer Croc Overhead Latex Mask. 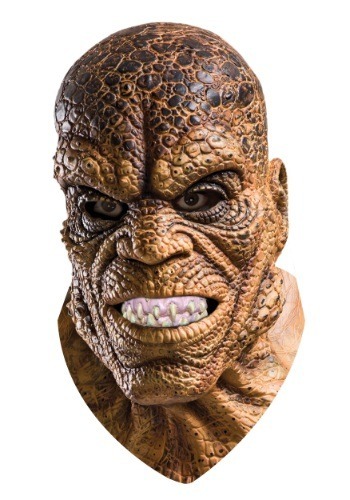 This overhead officially licensed mask is covered in textured scales that will stretch down and even cover your neck, so just zip up a velour hoodie and drape a gold chain around your neck and you'll be ready to team up with Deadshot and the gang to dole out some serious pain. We're rooting for you! Mostly because you terrify us and also because it can never hurt to have someone with razor-sharp teeth on our side, but also because we know that, deep down, under those textured scales lies a big softie. Go get 'em, ya big lug!